At the beginning of the twenty-first century, increased levels of terrorist activities and a higher incidence of food-borne illness made regulation and protection of the food supply a worldwide concern. The goal of food regulatory agencies is to ensure that the public food supply is safe from disease caused by infection from human handling or by contamination from chemical or other hazardous substances. Such contamination can occur during all phases of food production, including cultivation, harvesting, processing, packaging, storage, and cooking. In the United States, the regulation and safety of the food supply has received attention since the mid-nineteenth century. Today, many of the U.S. federal agencies serve as regulators or advisors for the food supply in the United States and throughout the world. There are four major U.S. federal agencies involved in food regulation and safety. 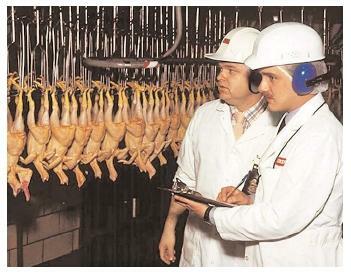 USDA staff working in the Food Safety and Inspection Service inspect more than eight billion birds annually. They ensure that raw meats are processed according to health standards, and help prevent and investigate outbreaks of food-borne illness. The U.S. Department of Agriculture (USDA) is the oldest federal agency that monitors the food supply in the United States; it was established in 1862 by President Abraham Lincoln. In its earlier years, the agency worked with farmers, who were the country's main source of food. Today, the mission of the USDA includes a goal that ensures people a safe, affordable, nutritious, and accessible food supply. USDA accomplishes this goal through the administration of a variety of food-related programs, all of which either assist suppliers or protect consumers. Consumers are protected by USDA programs that regulate and monitor soil, water, and wildlife on privately owned property; drinking water for rural Americans; and meat, poultry, and egg products for all Americans. Federal antihunger efforts, such as the Food Stamp Program, the National School Lunch Program, the School Breakfast Program, and the Special Supplemental Nutrition Program for Women, Infants, and Children (WIC) also serve a regulatory purpose by providing recipients access to safe food products. Other USDA services include programs for food suppliers, such as small-business owners and farmers, who can receive assistance in growing and merchandising safe foods. The USDA also runs the Food and Nutrition Information Center, which provides information to the public on a variety of topics related to food safety and healthy food choices. The Food and Drug Administration (FDA) is an operating division of the U.S. Department of Health and Human Services (DHHS). While the responsibility of DHHS is to protect the overall health of Americans, the FDA has a more specialized role in the oversight of food, drugs , and related products. The FDA was established after the passage of the Pure Food and Drugs Act of 1906. This act was the first nationwide consumer protection law, and it made the distribution of misbranded or adulterated foods, drinks, and drugs across state lines illegal. Today, the FDA is mandated by federal law to protect public health by ensuring the safety of the production, processing, packaging, storing, and holding of all domestic and imported foods, except for those products that are under the jurisdiction of the U.S. Department of Agriculture. FDA is also responsible for safeguarding all ingredients used in food products, approving new food additives , monitoring ingredients and foods to see that they are contaminant free, and monitoring dietary supplements, infant formulas, and medical foods for safety. The FDA oversees food labeling and requires that food product labels be informative, truthful, and useful to the consumer. The Hazard Analysis Critical Control Point (HACCP) system, one of the most well-known food safety monitoring programs in use today in the United States, is also sponsored by the FDA. In July 2003, the FDA submitted a ten-point program to DHHS that would ensure the safety and security of the nation's food supply. Under this program, the FDA will work with the Department of Homeland Security (DHS) to add more staff, develop bioterrorism regulations, assess threats to the food supply, and train food service workers and the public in emergency preparedness and how to respond to a crisis. Another operating division of DHHS is the Centers for Disease Control and Prevention (CDC). Established in 1946, the CDC collaborates with state agencies, private organizations, and other federal agencies such as the FDA, the Environmental Protection Agency (EPA), and the USDA to provide credible health information, primarily in the area of disease prevention. CDC's Food Safety Initiative Activity focuses solely on the prevention of food-borne illness by improving systems for disease surveillance and out-break response, as well as through research, training, and education. The Environmental Protection Agency (EPA) is a separate agency dedicated to the regulation of pesticide usage and the establishment of water quality standards for the United States. The agency has been in existence since 1970 and it develops and enforces regulations that implement federal laws written to protect the environment . The agency accomplishes this by collaborating with the states and Native American tribes, which have been given the responsibility for monitoring and enforcing compliance, and by issuing sanctions if the regulations are not followed. The EPA also provides financial assistance to states, nonprofit organizations, educational institutions, and small businesses to support research, education, and public awareness programs. Voluntary efforts, cosponsored by industries, businesses, nonprofit organizations, and state and local governments can also receive assistance from the EPA. Although not a regulator in the truest sense, the World Health Organization (WHO) establishes policy and makes recommendations regarding the safety of the world food supply through its Food Safety Department (FOS). A primary focus of the FOS is the reduction of the negative impact of food-borne disease worldwide. Recently, a resolution was adopted by WHO to recognize food safety as an essential public health function, and to develop a global strategy to reduce the burden of food-borne diseases. Because the responsibility for food safety is often divided among several agencies with overlapping authority, there have been many challenges in solving the problems of worldwide food-borne disease. To address these challenges, the FOS is developing an integrated production-to-consumption approach to food safety for its 192 member states. The approach is patterned after the FDA-sponsored HACCP program. Other activities of the FOS include monitoring food, air, and water-supply pollution; observing food manufacturing and processing for the presence of additives and contaminants; conducting research on the safety of genetically modified foods; amassing larger food and supply inventories for countries to access in times of disaster; and assisting with the management of malicious contamination of food for terrorist purposes. The World Food Safety Organization. In conclusion, various aspects of the U.S. food supply are monitored by the USDA, FDA, CDC, and EPA. These federal agencies collaborate with state and local governments, as well as with nonprofit organizations, private businesses, and individuals to oversee the safety of the food supply for the United States. While each of these agencies also works with foreign countries to assist in the quest for a safe food supply worldwide, the WHO functions in a policymaking capacity for its 192 members, and provides a greater overall international presence in this effort. The importance of securing the safety and security of food for all countries of the world will continue to be of great importance, as commerce becomes more global and more new products are introduced through bioengineering and other means. The regulation and monitoring of the continuum from grower to consumer will require a great deal of collaboration among all countries of the world in order to be successful. SEE ALSO Food Safety ; Health Claims .